JOSIAH KERRICK, of the firm of Kerrick & Humphrey, proprietors of the Minonk Rolling Mills, occupies an important place in the business circles of Woodford County. Under the energetic management of himself and partner, the manufacture of flour has become one of the leading industries of this part of Illinois. Our subject is serving with distinction his second term as Mayor of Minonk, and under the wise and farsighted policy that governs his administration of affairs, the city has entered upon a new era of prosperity, and is flourishing as never before. Mr. Kerrick is a native of Indiana, born in Franklin County, July 20,1848, to Armisted and Sarah A. (Sloan) Kerrick. This article was taken from the PORTRAIT AND BIOGRAPHICAL ALBUM OF WOODFORD COUNTY, ILLINOIS and published by Chapman Bros. of Chicago in 1889. 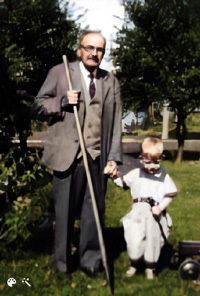 Josiah Kerrick is pictured here with Albin Johnson in 1932 when he was 84 years old. The picture is the courtesy of Albin Johnson who was two when this picture was taken. Biographical sketch and parental history of: REV. ARMISTED KERRICK. "Mr. Kerrick has traveled more miles, preached more sermons, made more prayers than any other local preacher in the State." The quote is from the Rev. John W. Rogers, endorsed by the Rev. Richard Haney, one of the pioneer ministers of the Methodist Church, and his son, the Rev. James Haney. Not only has Mr. Kerrick delivered many discourses but he is also noted for the ability and the power displayed through the medium of his sermons. He is known by everyone within many miles, and wherever he has gone his name is a household word, as belonging to a minister who has accomplished a great good in his county and State. He is very outspoken in his opinion, and speaks his sentiments without fear or favor. The Rev. Mr. Kerrick resides in Bennington Township, Marshall County, where his home has been from the year 1856. He is the son of Thomas and Phoebe (Carethers) Kerrick. The Kerrick family is of Irish extraction, but for many generations have been residents of the United States. In 1824 the family removed from their Eastern home to what was then considered the far away West, Muskingum County, Ohio. Later their residence was in Franklin County, Indiana. Thomas Kerrick was a carpenter by trade, but before leaving his first home in Virginia he met with an accident, which debarred him from working longer in this trade. He had been injured in Virginia by a runaway horse, and was left a cripple for life. When he left his native State he was scarcely able to walk, while he carried his arm in a sling for some time. He had only $27.50 to carry himself and his family to their new home, but after reaching Muskingum County he taught school and two of the sons engaged in cutting wood. The wood thus obtained they exchanged for salt, for which they paid twenty cents per bushel. The autumn succeeding their arrival they were enabled to get the means to continue their westward journey, and with a one-horse team, immigrated to Franklin County. From that place they again removed in 1840 to Decatur County, Indiana. In this county the boys grew up, obtaining such education, as was possible, which as may be readily imagined was very limited. 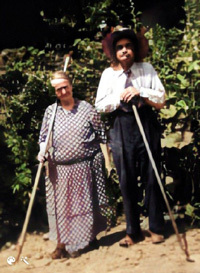 Their land was rented, and they were compelled to work very hard especially at first, to make both ends meet. Thomas Kerrick for many years employed himself as a teacher, for which position he was naturally adapted by this thoroughness and patience, as well as by his education. During the latter part of his life he was quite deaf and almost blind, so that he would consent to take only very small schools. He passed away in 1856, at the homestead in Decatur County. His wife lived some years thereafter, and during the last portion of her life was also nearly blind. Thomas Kerrick and his wife had a family of eight children, whose names are given as follows: Nimrod, a resident of Bloomington, Illinois; James, who died in Decatur County; Walter, who died in Marshall County, Illinois; Armisted, of this sketch; Johanna and Stephen, both died in Decatur County, Indiana; Hugh passed from earth in Rush County, Indiana; Mary married James Thorp, of Decatur County. Armisted Kerrick is a native of Loudoun County, Virginia, and was born February 21, 1819. The principal portion of his boyhood and youth was spent in Franklin County, Indiana. At the age of twenty years he went to Decatur County to clear up some land and prepare it for a residence for his parents, who removed there the following year. When prepared to establish domestic ties of his own our subject was united in marriage with Miss Sarah A. Sloan. He was a brave man, assuredly, for when he formed a home of his own he was penniless, but with the natural courage of youth he feared no future, however dark. His wife was born in Union County, Indiana. After their marriage he rented land, and began by persevering, unremitting work to lay the foundation of future comfort. He was able in 1845 with the assistance of his father, to purchase eighty acres of land in Franklin County, on which he settled. Rev. Mr. Kerrick was prevented from assiduous labor for a long period, on account of an unfortunate accident, which occurred before his marriage. He had his knee cut by an ax, and it was sufficiently severe to cripple him for some time. He suffered from poor health often after that, but never allowed it to interfere with his chosen calling, the preaching of the Gospel. From Indiana Mr. Kerrick and his family removed to Low Point, Woodford County, Illinois. He was now the possessor of about $3,000 in money, and the first year of his residence in the new home he cleared 123 acres of land in three different pieces. He has occupied his present home since 1864, and is now the owner of 566 acres of land, which he has improved until it, is in good condition. Mrs. Kerrick died in 1870, March 19, leaving nine children, two having already preceded her to rest. Their names are: Joanna, wife of Ahua Rogers, Mary, Stephen, deceased; Josiah, Thomas, resides in Kansas; Jacob W., deceased; Harrison, James, in Minonk; Henry, of Bloomington, Illinois; Benjamin B. and Phoebe. The second wife of Mr. Kerrick, who yet remains by his side, was Mrs. Jane (Burleigh) Soures. She was born in Perry County, where her father, Tazalear Burleigh, still lives. By his second union Mr. Kerrick has had thee children, namely: John B., Tazalear, and one daughter, named Orpha, who died when only five years old. Mrs. Kerrick, by her former marriage, had one child, a daughter, Minnie Soures. In politics Mr. Kerrick is a Republican, and is very proud of the fact that in 1840 he voted for General W. H. Harrison, and in 1888 for Benjamin Harrison for the Presidency of the United States, and has five boys who voted for Harrison. Mr. Kerrick for many years has been an ornament to the Methodist Church, of the State of Illinois. He has benefited the church in which he officiates as minister, by the purity of his life, which is an example all men might follow. He will be sadly missed when called away from the ranks, but can rest in the knowledge of the fact that he has been faithful in the few things, which have been committed to his care, and thus will be prepared for the greater joys that yet remain unto the people of god. As in turning over the pages of the family Album the eye pauses longest before the faces of those we most tenderly love and most highly esteem, so in perusing this ALBUM, the reader's gaze will rest lingeringly and lovingly upon the portraits of Mr. Kerrick and his wife, who have grown old in the Lord's vineyard. Our subject was about eight years old when his parents came to Illinois to settle, and he was reared to manhood in this and Marshall County, bred to a farmer's life. His father being a man of means gave him every advantage to secure a good education, sending him, after he had left the public schools, to Wesleyan University, where he pursued an excellent course of study that well fitted him for his career in afterlife. Having more of a taste for an active business life than for farming, in 1874 he left the farm, and coming to Minonk, purchased an interest in the Minonk Mills, which were thenceforth conducted under the firm name of C. Dobson & Co. for some years, our subject having the management of the mills while associated with Mr. Dobson. In 1881 he bought his partner's interest in the business, and was sole proprietor of the mills for one year. At the end of that time he admitted Mr. Humphrey into partnership. They have improved the mills, and enlarged their capacity to eighty barrels a day, and they have introduced first-class machinery, and have everything in good shape, and do a large business. Mr. Kerrick has acquired wealth by his enterprise, and owns other valuable property in Minonk. Mr. Kerrick and Miss Margaret E. Hollenback were united in marriage in 1870, and the four children born of their wedded life complete their pleasant home circle: Eva L., Harrison S., Florence E., Elsie E. Mrs. Kerrick is a native of Woodford County, and a daughter of Jacob and Margaret (McClune) Hollenback. On November 25, 1910 Mr. Kerrick's mill, which was located near West Fourth and Lincoln Streets, burned to the ground in a spectacular fire that could be seen as far away as Peoria and Bloomington. Mr. Kerrick lived in Minonk until he died in 1943 at the age of 95. Josiah Kerrick with his daughter Eva L. Estes. The picture is the courtesy of Albin Johnson.